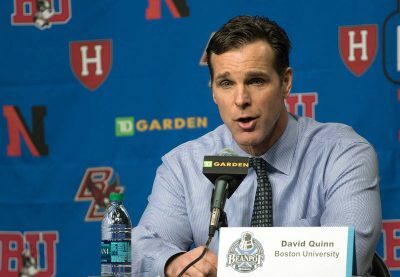 After a five year span including two Hockey East regular season titles, two Hockey East Tournament championships, a National Championship appearance and four straight NCAA tournament showings, former Boston University men’s hockey head coach David Quinn has been named the 35th head coach of the National Hockey League’s New York Rangers. The deal is believed to be over the course of five years and $2.4 million per year. The 2015 Hockey East and New England Coach of the Year will be making his second appearance as NHL coaching staff — he previously spent the 2012-13 season as the assistant coach of the Colorado Avalanche before returning to BU. The Cranston, Rhode Island, native and BU alumnus replaces former head coach Alain Vigneault on the Rangers’ bench. The Rangers fired Vigneault in April after the team missed the Stanley Cup Playoffs for the first time since 2010. During his five seasons as the Terriers’ head coach, Quinn amassed a 105-68-21 record, including a nine game unbeaten streak this past season, the longest for the Terriers since the 2008-09 National Championship — a team on which Quinn served as an associate head coach. Quinn will have a familiar face on the Rangers’ blue line in former Terrier defenseman and captain Kevin Shattenkirk. Shattenkirk was one of the six defensemen who played for BU’s 2009 National Championship that reached the NHL. Although only five coaches have previously made the jump directly from NCAA hockey to the NHL, Quinn joins former University of Denver and current Dallas Stars head coach Jim Montgomery, who made this similar move this past season. Current head coach of the Philadelphia Flyers, David Hakstol, made the jump in 2015 after 11 seasons at the University of North Dakota. He led the Flyers to the playoffs in two out of his three seasons. Coaching on a big stage is nothing new for Quinn — he coached the United States National Team at the International Ice Hockey Federation World Championship five times and also both the Under-18 and Under-20 World Junior Championship, all as an assistant coach. Quinn was named the head coach for the upcoming Under-20 World Junior Championship for 2019 in April. With the hiring of Quinn, there are now three former Terriers who are head coaches in the NHL. Mike Sullivan coaches the Pittsburgh Penguins, while John Hynes leads the New Jersey Devils. Both Sullivan and Hynes led their teams to the playoffs this season. The national search to find the Boston University men’s hockey team’s next head coach will begin immediately. Thanks for the memories! Another B.U. guy not afraid to try to succeed at the highest level. No matter what happens, you won’t be haunted for the rest of your life by ‘I should have gone for it all’. Do it your way; best of luck in your new adventure in NYC!